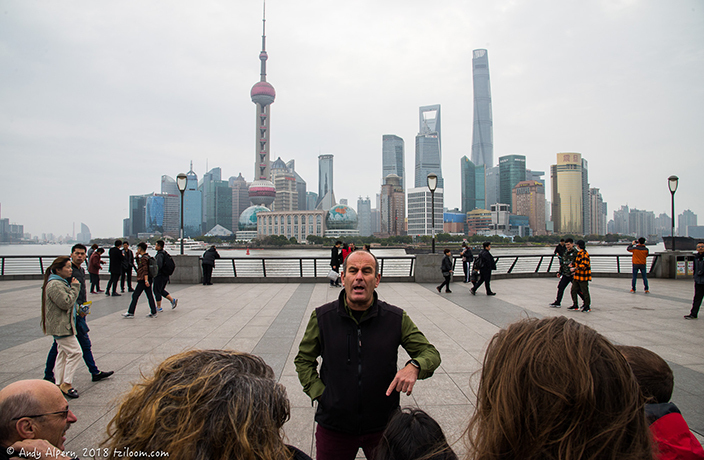 Israeli native Dvir Bar-Gal has been leading tours of Shanghai's fascinating Jewish history for the past 17 years. 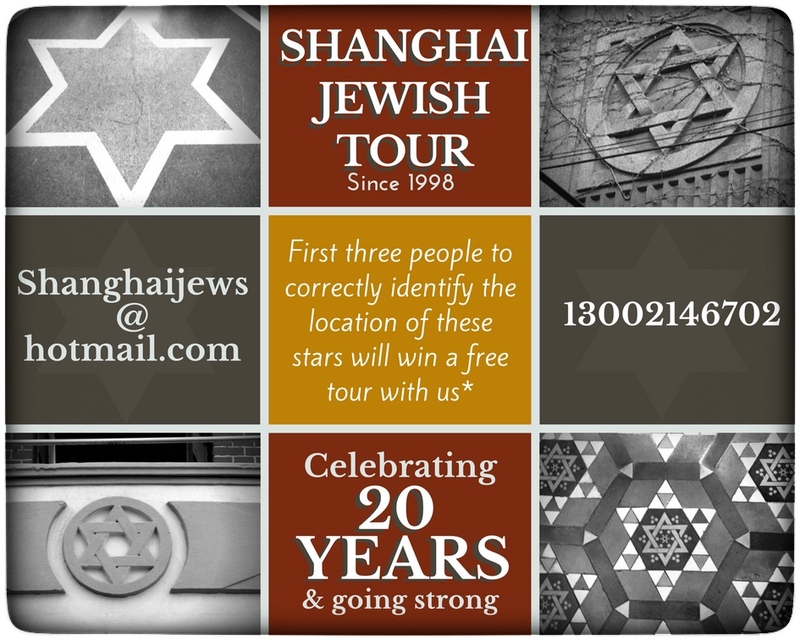 Shanghai Jewish Tours started back in 1998 and is currently celebrating its 20th anniversary. In honor of this huge milestone, we chat with Dvir about the history of Jewish immigration and culture in Shanghai, the best spots for Israeli food and his new City of Stars Quest. What is your background and how did you come to be in Shanghai? I was working in Israeli TV throughout the 1990s. At the end of August 2001 I moved to Shanghai planning to be a freelance TV journalist. Two weeks after my arrival to Shanghai and in the very same day I moved to my first apartment, I went to dinner with my new Chinese friend. After dinner I came back to my apartment and switched on my TV. The date was September 11. Things were not the same anymore. The plans that I had never really came through. The media in Israel were not looking for stories from China for the next two years. By then I was doing other things. How did the tours first get going? Soon after I [arrived] I took the Jewish Heritage Tour of Shanghai, which was run at that time by Georgia Noy. When Georgia realized I was working in media she told me that antique shops in Shanghai's Hongqiao area sold old Jewish gravestones. She thought it may be an interesting story. I did not think that the story would keep me busy and was not too enthusiastic. Then, Georgia told me that Shanghai [once] had four Jewish cemeteries with nearly 4,000 Jewish graves and they all disappeared from the ground. Through the 1990s, people came from abroad to look for the places their ancestors were buried [but] no one could show them where to look or explain why the gravestones weren’t there anymore. To make a long story short, we went to the antique shop and from there we started our research that led us to the west of Shanghai – in the Qingpu district farming areas – where one after the other I started to locate lost Jewish gravestones. Collecting these lost relics, storing and restoring them with the hope to make a memorial site in Shanghai is an unprecedented project that has kept me busy for 17 years. When Georgia left Shanghai she asked me if I would like to help her with guiding the Jewish Heritage Tours, and it’s something I’ve done ever since. How is the project to recover headstones from the Jewish cemeteries in Shanghai going? We still keep the hope that the Shanghai authorities will allow us to create a memorial site using the many gravestones I've located. I keep telling myself that nothing is easy in China but anything is possible. Can you tell us about the different waves of Jewish immigration to the city and the reasons for them? The story of the Jews in Shanghai is extraordinary because it was a really short historical [period] of 110 years, from the mid 19th Century to the mid 20th Century. But in Shanghai these 110 years contain three remarkable and separate Jewish chapters. The first were Jewish traders of Baghdadi origin. They became the financial movers and shakers of our city in the late 19th century and early 20th century. Their legacy still stands tall at many places in the Bund, the French Concession and along Nanjing Road. The second Jewish group came from Russia in the early 20th Century. [They were] people who had run away from pogroms and growing anti-semitism. They contributed to Shanghai by establishing the backbone of middle-class business as well professions in academics, health and high culture. The last Jewish group spent the shortest time in Shanghai, on average they lived in Shanghai for 8-10 years, but this is the group that makes the story of Jewish Shanghai a bit more known today. It was a big group of Jewish refugees running away from the Nazis and getting as far away as they could get from Europe. For people who have never been on the tour, what can they expect? Do you have a favorite building on the tour? 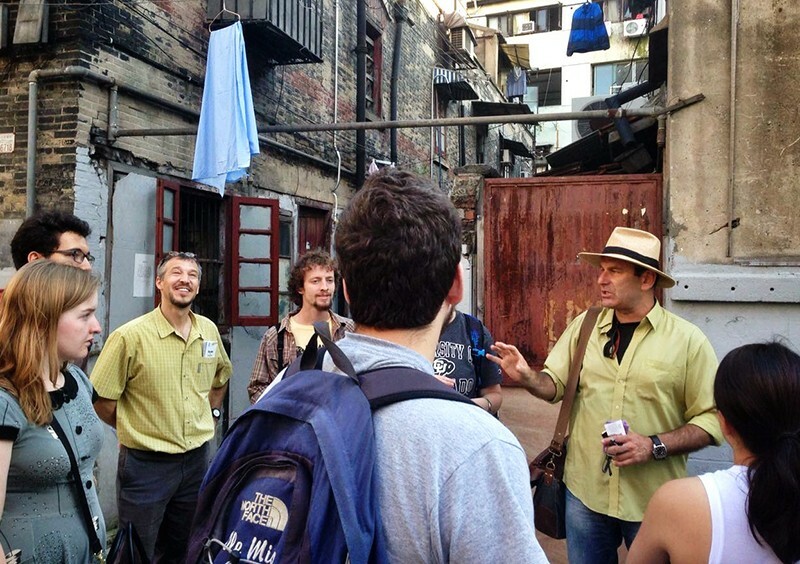 Our tour takes [visitors] from luxurious places to great poverty – all that Shanghai offers through the Jewish storyline. What plans do you have to mark the 20-year anniversary? I've announced the City of Stars Quest. Not many people know that around our city, one can find many Jewish stars. They can be spotted over outdoor walls or indoors over staircases, on old housing flooring, balconies and other places. 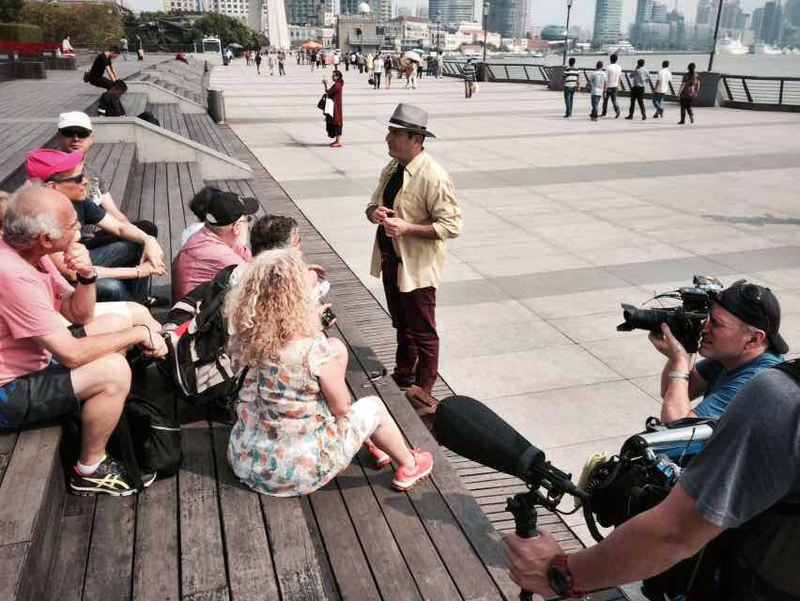 For the search for Shanghai’s Jewish stars we will reward [participants] with a free tour. 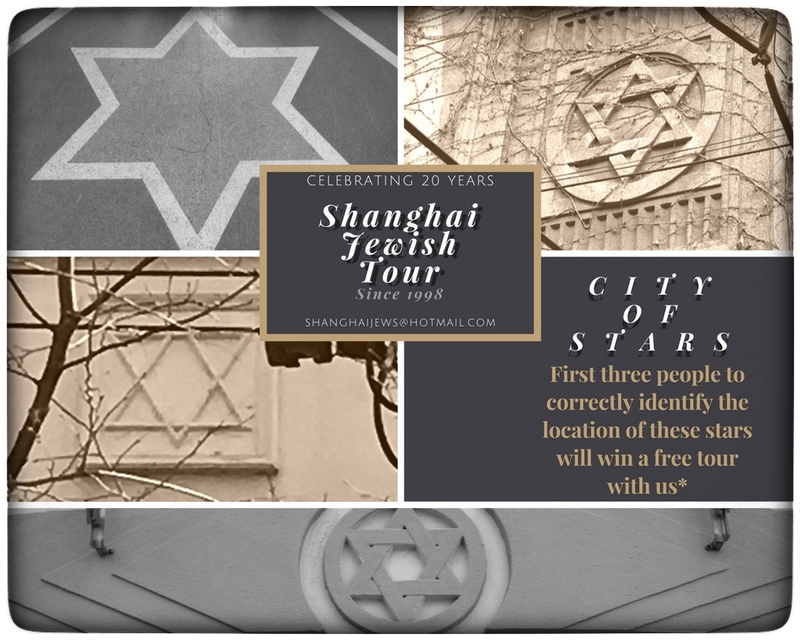 * The first three people who correctly identify the locations of the stars in the postcard (pictured below) or to anyone who will send us a picture of a historical Jewish star in Shanghai that we do not yet know about, along with its location. 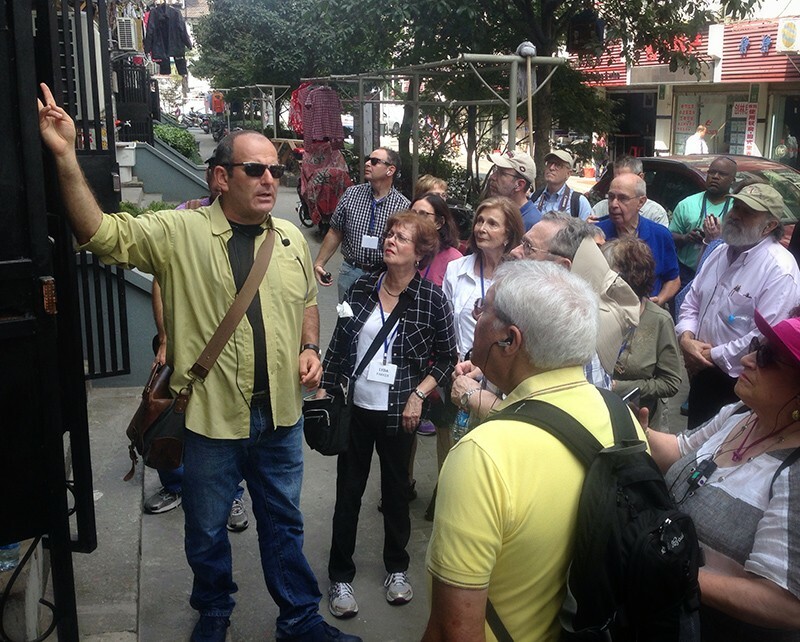 Can you tell us about interesting people who have taken your tour? If Hollywood stars and Oscar winners are interesting people. If ministers, Nobel laureates and former heads of countries are interesting, then yes I can tell you about them... But for me it's more interesting to tell you about the people taking my tour who were part of these historical Jewish communities in Shanghai. Almost every week, I take people who are related to the Jewish heritage of Shanghai. Listening to their stories and learning from their experience [helps me build] the commentary I provide to the guests of my tour. Only this week, mid-April, within six days I had five different people connected to Shanghai’s past. A grandson from Israel of a Baghdadi family, An Australian lady daughter of a Russian Jewish parents who lived in the former French Concession and three others related with the WW2 refugees. Take for example Mrs. Noemi Dalidakis (née Strauss) from Melbourne, who came to Shanghai this week with her son, his wife and his kids. Three generations came to trace the footsteps of grandmother, Noemi who was born in 1940 at the Hongkou area. Her father Gottfried was arrested and imprisoned for over three long years by the Nazis in Dacau and Bucenvald. With restless dedication of his loving wife, Irene, she had managed to get them papers to leave Europe. They made their way to the other side of the world with almost no financial means. Starting with nothing beside hard work they managed to rent an apartment at 81 Zhoushan Lu, giving life to two little girls, Noemi and Dagmar, and surviving the war only to start all-over-again in Melbourne. 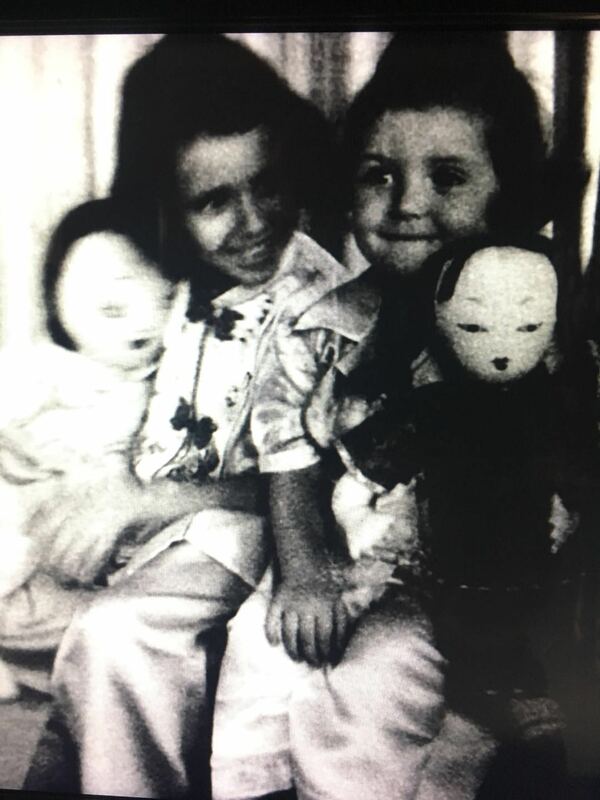 Just before leaving Shanghai in 1946 their parents captured young Noemi and Dagmar in Chinese customs holding sweet-China-dolls, an image that became one of the icons for that time (below). Standing at the staircase of her war-time-childhood home in 81 Zhoushan Lu, Noemi shared her experience with her grandkids and the rest of our groups. An emotional and inspiring experience to all our guests that day. And this happens in our tour frequently, ever since we started it. Do you have a favorite story among your repertoire? Yes, how much time do you have? Maybe it's simply better to join the tour and hear those incredible stories!